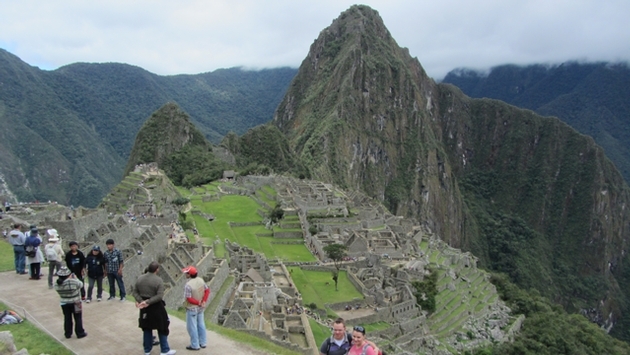 A visit to Machu Picchu tops the bucket lists of countless travelers of every stripe, from back-packing adventurers seeking inspiration at 7,970 feet to upscale globe trotters with the means to reserve deluxe hotel and resort accommodations and the desire to explore one of nature’s fabled landscapes. Peru is in fact filled with noteworthy archaeological sites, including several within the lush Urubamba Valley, the natural gateway to Machu Picchu’s sweeping mountain slopes. Yet it is the site’s regal mysticism that likely accounts for its supremacy among Peruvian historic attractions. The site’s regal mien is as powerfully felt by travelers today as it was more than 600 years ago, when the Incan emperor Pachacuti, according to contemporary historians, commissioned the stone sanctuary as his estate. Officially known as the Machu Picchu Historical Sanctuary, the site provides sweeping views of the broad, green Urubamba Valley below and today is widely recognized as the primary architectural symbol of South America’s pre-Columbian Inca culture. Orient-Express operates the Hiram Bingham, a deluxe rail service which travels from stations in the Urubamba Valley towns of Cusco, Poroy and Ollanyatambo to Machu Picchu’s Inca Citadel. The journey from Cusco takes about three and one-half hours and provides travelers with the kind of scenic rail journey most have only experienced in old movies. 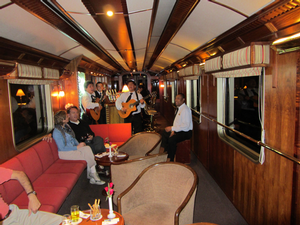 Hiram Bingham passengers travel in a manner that evokes Roaring Twenties high style. Passengers nestle in cozy booths of polished brass and wood topped with etched glass partitions, at tables lit by linen-shaded table lamps. As the railroad winds through the picturesque Andes Mountains landscape, guests enjoy an elegantly served brunch. Upon arrival at the site, travelers have access to an exclusive entrance to the site from which guided tours of the Inca Citadel are available. The return trip to Cusco begins at 5:50 p.m., when the train turns into a clubby private lounge on rails, as passenger sip cocktails and enjoy live musical entertainment, followed by a four-course gourmet meal. The city of Cusco was the ancient capital of the Incan Empire, and today features numerous ancient structures, from city walls to ceremonial temples and grounds. Cusco is also the traditional starting point for travels to Machu Picchu, as visitors can prepare for the latter’s high altitudes by spending a couple of days in Cusco, which is actually at a higher elevation (11,200 feet above sea level). Remains of several grand structures built later by the Incas remain in existence around Cusco, including the Palace of the Incas, the Temple of the Sun, and the Temple of the Virgins of the Sun. Visitors can tour these sites or simply stroll along the cobblestone streets and stone sidewalks, through the many arcades and plazas, while marveling at the imposing historic buildings and shopping for cultural items and souvenirs at the city’s busy markets. There are also many colonial buildings, built after the Spanish explorer Pizarro sacked the city in 1535. The colonial buildings are highlighted by the Cathedral of Santo Domingo. After the Spaniards learned that Incan buildings and foundations did not collapse during earthquakes, they built several of their own buildings on original Incan foundations. 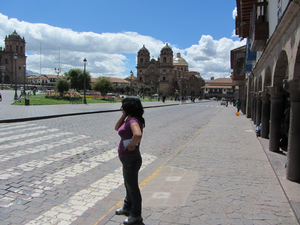 The Plaza de Armas, known as the "square of the warrior" during Inca times, is the city’s main plaza and gathering place, and the scene of several important events in the city’s history, including Francisco Pizarro’s proclamation following his conquest of Cusco, and the death of Tupac Amaru II, leader of the failed 1780 indigenous uprising against Spanish rule. These days the square plays host to numerous religious and cultural celebrations, which feature colorful costumes, plenty of Peruvian music and dancing. Children in Cusco have even warmed to the American celebration of Halloween and visitors to the square on October 31 will find hundreds of children in a variety of inventive costumes greeting adults with shouts of “Halloween!” their version of “trick or treat,” the usual signal to adults to hand over the treats. The Uruabmba Valley features soaring cliffs that frame lush green plains fed by bubbling rivers that descend through an endless array of picturesque adjoining valleys and gorges. The regional towns of Calca, Lamay, Pisaq and Ollantaytambo feature archaeological sites ranging from hilltop ramparts to still-functioning ancient villages. The valley was revered by the Incas for geographical and climatic qualities that make it a rich source of agricultural and mineral resources, the perfect land for farming and raising livestock. Today the valley offers a fascinating look into Peru’s history as well as its contemporary people and culture. Pisaq is one of several villages that feature sprawling outdoor markets where locals dressed in traditional colorful attire sell hand-made goods, craft items and produce for Peruvians as well as tourists. Travelers can also opt for tours that take visitors to traditional stone –floored Peruvian homes where modern-day residents live in much the same way as their ancestors, raising small families of guinea pigs, which are considered a delicacy in traditional Peruvian cuisine. There are several upscale hotel properties in Cusco and the Machu Picchu region. 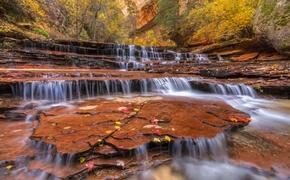 Travelers with the means should not neglect to sample of the fine regional properties. The 128-room Tambo del Inka resort, nestled deep within the Urubamba’s peaks, is a refined contemporary property set amidst an emerald lagoon and blooming river-side gardens. Accommodations feature floor-to-ceiling windows offering views of the Andes and the Vilcanota River. Tambo del Inka's 5,905 square-foot Spa at Valle Sagrado features treatments and therapies that utilize ancestral Incan ingredients including quinoa. Palacio del Inka is located in Cusco’s historic city center in the Cuatro Bustos mansion, whose origin dates back nearly 500 years. The property offers 203 finely appointed guest rooms with Peruvian art and handcrafted furnishings. Amenities include premium bedding, LED televisions, Internet access, and iPod docking stations. The hotel’s spa features indigenous treatments and an indoor therapy pool. The Inti Raymi restaurant offers authentic Peruvian fare. The 90-room El MaPi Hotel offers the convenience of its location in Machu Picchu Pueblo, the village at the foot of the site. The hotel will expand to 130 rooms in September. The boutique property features high ceilings and panoramic windows, with amenities like cozy duvets, robes and branded toiletries. All rooms are equipped with DirecTV, telephones and reading lights, and train station transfers, luggage storage and Wi-Fi are included in hotel rates. 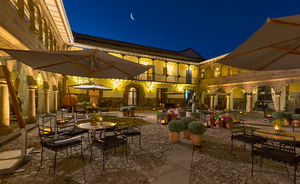 Palacio Nazarenas is an all-suite boutique hotel in a former 16th century convent at the center of Cusco’s Nazarenas Square. The hotel features original Inca walls and colonial frescos, and the 55 suites are set among interlocking courtyards overlooked by wooden balconies. Suites feature under-floor heating and free-standing baths. Orient-Express offers a special package that offers guests gastronomic tours of Cusco with the hotel‘s executive chef.